Learn how AMAS assists administrators in safeguarding university resources. AMAS has a fact-finding role in investigations related to the potential misuse of university resources. These responsibilities, related investigation procedures, and rights of potential "whistleblowers" are described in the UC Whistleblower Policy. If members of the UCSD community—faculty, staff, and students—have concerns about possible improper activities that may place the University at risk, we encourage them to discuss their concerns with their supervisors, managers or department heads. We recognize that sometimes an individual would prefer an alternative avenue for reporting concerns about compliance with policies and procedures that allows anonymity or confidentiality. 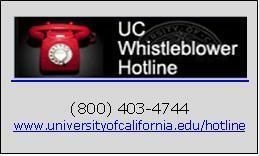 For this reason, concerns about potential fraud, waste, misuse of assets, or non-compliance with University policy may be reported anonymously through the toll-free Hotline at (800) 403-4744 or electronically at www.universityofcalifornia.edu/hotline. Reports will be forwarded to the appropriate campus department or program, for example, to Audit & Management Advisory Services or the UCSD Healthcare Compliance Office. For concerns about potential misconduct in research, you may want to reference the UCSD Research Ethics Program webpage.